The King Stack is a cyclical stack. Probably the world's easiest cyclical stack to date. As easy as the Si Stebbins stack. But much more random looking for both values and suits. If you can add 1 and 2 then you can instantly learn the King Stack , it is that simple and easy. It should not take more than 3 minutes to actually fully learn it. The real core principle of this stack can be explained in just 2-3 sentences. It is that simple and yet looks fairly random. 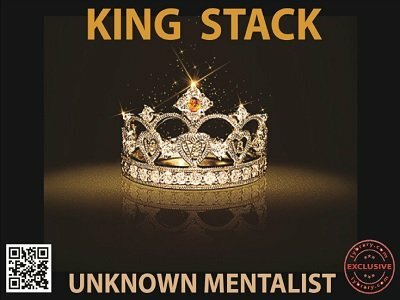 The King Stack is so named because the Kings have a special place in this stack and play a key role. A hidden beauty of the King Stack is that with a little more effort, one can also learn to use this as a memorized deck. All that is fully and clearly explained. Using another hidden feature of this King Stack , a prop less (the deck of cards is used just as a tool and not as any prop for the which hand routine) and totally self working which hand routine is also included which is both fun and baffling. You will surely enjoy the look on the face of your participant at the end of this routine. 1st edition 2018, 16 pages. This is one of the simplest stacks I have ever learned. It took me about 10 minutes to get the stack and the random suit order firmly implanted in my mind. To me the advantage in using this stack is that you can QUICKLY calculate the next card in the stack when you need the information almost IMMEDIATELY for certain mentalism effects. Another couple of bonuses are you can easily use this stack as a memorized deck and also the bonus which hand effect is also good. Now my favorite stacks are the SLOKA DECK, KARMA DECK and KING STACK! I recommend this very highly!! !